The more student loan debt a graduate holds the lower their well-being, Gallup's survey found. Student loan debt isn't just hurting college grads financially, it's also having a negative impact on their overall well-being. 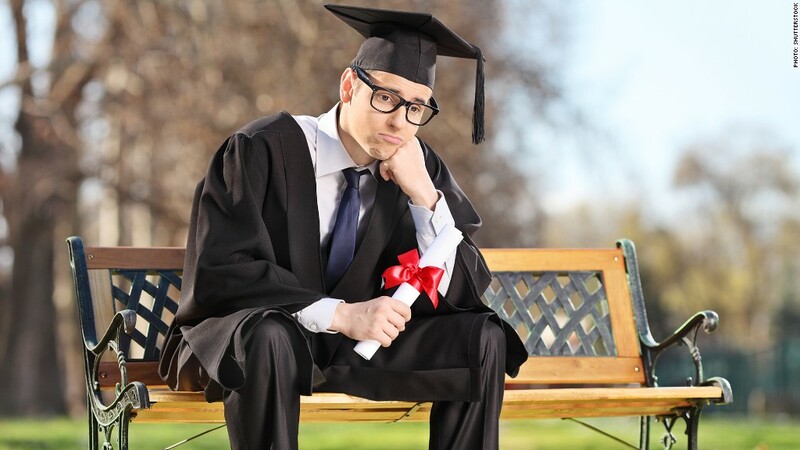 College graduates without any student loan debt were seven times more likely to be happy and thriving in most areas of their lives compared to those with more than $40,000 in debt, according to a Gallup-Purdue University study. To measure well-being, the survey asked more than 30,000 grads about their sense of purpose, happiness within their community, social lives, finances and health -- with questions about whether grads like what they do every day and if they have enough money to do what they want. "The amount of student loans that graduates take out to pay for their undergraduate degree is related to their well-being in every element," the study states. "The higher the loan amount, the worse the well-being." Is the cost of college crippling? Student loan debt impacts graduates in other ways, too. Graduates with large debt burdens were significantly less likely to start businesses, for example. Contrary to the thinking of many families these days, the kind of institution a graduate attended -- its size, selectivity or whether it was private or public -- had little impact on their future well-being and workplace engagement, the study found. What did matter, however, was the experiences graduates had while in college. Getting support from professors who cared about them and encouraged them to learn and follow their passions, having internships or jobs while in school, working on long-term projects and being involved in extracurricular activities all contributed to more positive post-college experiences. Yet only 3% of students reported having all of these positive experiences. "Those elements -- more than many others measured -- have a profound relationship to a graduate's life and career. Yet too few are experiencing them," the study states.